Intuit, the company that makes personal and small business software, has launched a new capability called “Federated Applications” that allows SaaS developers to write their applications using any programming language and cloud platform and connect them to the Intuit Partner Platform. Intuit’s Partner Platform provides a foundation for developers to build and deploy apps that can be integrated with Intuit’s small business accounting software, QuickBooks. QuickBooks has close to 25 million users within 4 million businesses who can buy these apps on Intuit’s own version of its Salesforce.com-like App Store, Intuit Marketplace. 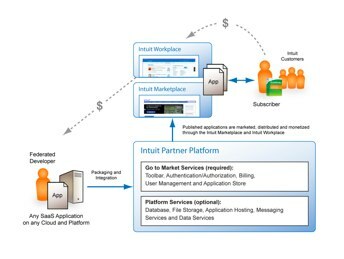 The “Federated Applications” functionality lets developers who have existing SaaS applications that are built with any programming language, database or cloud computing platform publish their apps on Intuit Marketplace. Applications won’t have to be rewritten to conform to QuickBooks but will instead go through a minor configuration process. Last year, Intuit opened up the API to its management software, QuickBase, to developers who wanted to build web applications and businesses on top of the product, in an effort to enter a space already occupied by Salesforce.com, Google, and Amazon. This recent news seems like another strategic move for Intuit to open up its app marketplace in order to gain a greater variety of apps from different developers. Previously, developers were limited to developing an app for QuickBooks directly on Intuit’s Partner Platform and then could only market that app solely on Intuit Workplace. Now, app developers who have SaaS offerings on other CRMs or software products can tap into the QuickBooks community, and vice versa. For example, Vertical Response, which creates an e-mail marketing, online survey and direct mail application, sells its app on the Salesforce.com AppExchange and will now sell its app on Intuit Workplace. The VerticalResponse app that sells on Intuit Workplace adds sales and marketing tools to the accounting functionality of QuickBooks. Other “Federated Apps” on Intuit Workplace include Dimdim, a web conferencing tool; Rypple, a collaborative app; Setster, which assists with scheduling; and ExpenseWare, a travel and expense reporting application.